There will be a dulcimer workshop held on Saturday, June 1, from 1-4 p.m. (continuing dulcimer with Aubrey Atwater and beginner dulcimer with Elwood Donnelly). Minimum of 5 students needed to hold each workshop; maximum of 14 students. Workshop fee is $30.00. The many possibilities of the mountain dulcimer are part of the beauty of this extraordinary Appalachian instrument. 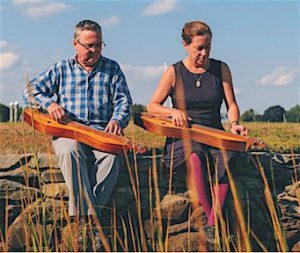 Moving at a comfortable pace, the dulcimer will be approached from a variety of angles: singing and playing chords, tunings, using the traditional noter, strumming, fingerpicking, flatpicking, and any other topics that may "happen" as a result of group chemistry and as time allows. Participants will leave the class amazed with themselves and full of new ideas. Aubrey and Elwood will be teaching these classes which will be divided into two levels, beginner and continuing. For the beginner class, participants need no prior knowledge of reading or playing music! If you can, please bring a dulcimer in good playing condition; otherwise, contact Aubrey about renting at: aubreyfolk@aol.com or by calling (401) 392-1909.